Christ’s main reason of coming here on earth is to show/reveal to us who the Father is, teach us how to Communion with the Father and live under His instructions and direction. In Christ we see, we experience who God is, what He is to us and what He expects of us. Even if you don’t understand the Father now, He understands you, No one knows the Son except the Father - nothing is secret about you, if you don’t know the Father, He knows you as your creator but when you know Him as a Father the relationship is sweet. Jesus never said God referring to His father. The language has to change if we are to see the fatherhood of the Almighty in our lives..
Philip says that knowing the Father is sufficient enough, satisfaction. I always watch some programmes on adopted children or family who will be seeking to know their real dad/mum and it’s fulfilling when you see them meeting each other. 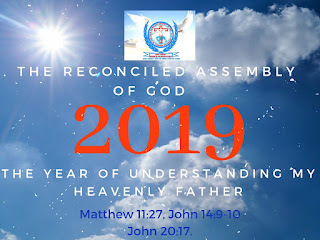 Brethren 2019 years ago, God the Father was walking here on, He touched what you touch, He saw what you see, He smells what you smell, He heard what you hear and tasted what taste. We are assured of this..
God can only extend His fatherhood to us by being in Christ by faith. The fatherhood can only be extended to us when we are willingly to take on our identity in Christ Jesus. Jesus said, I am the way the truth and the life, no one come to theFather but by me - John 14:6. When we are in Christ Jesus, our spirit witnesses with the Spirit of the Father and we are able to call Him ABBA Father. The Way, one not ways, we are privileged to have The Way. There is no other way to communicate with God the Father than Christ, so the one to be exalted in our lives should be God and no other. Good and perfect gifts are not from the pastor or prophet, they come from the father. I don’t know about you but as for me by end of this year my position will be among the great men. I have no doubt the the gift provide to by God when put in use will create room of second in command of Israel. Don’t expect only the above without be reprimanded. As a father if I don’t discipline my children, when they do all sorts of things I shouldn’t complain or cry to God. “To discipline a child produces wisdom, but a mother is disgraced by an undisciplined child. Reconciled Assembly Of God Charity (Number 1161259). Picture Window theme. Powered by Blogger.